Seth Rudy joined the faculty of Rhodes College in August 2010, after having completed his PhD at New York University. A student of British literature from the “long” eighteenth century, his classes address authors and areas of inquiry from the Scientific Revolution to the end of the Romantic period. Prof. Rudy is particularly interested in the history of ideas and large-scale knowledge projects. 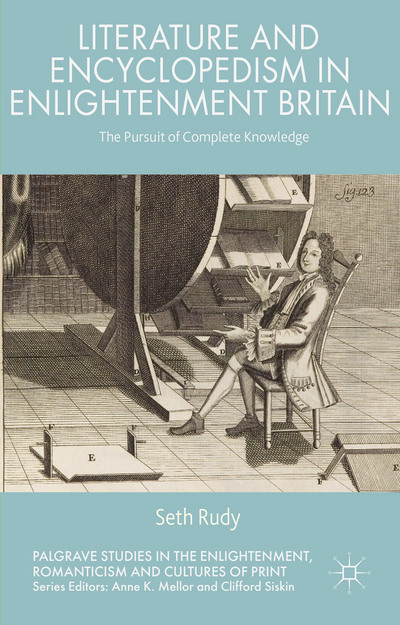 His first book, Literature and Encyclopedism in Enlightenment Britain, tells the story of long-term aspirations, first in ancient epic and then in a wide range of literary and non-literary works from the early modern era and British Enlightenment, to comprehend, record, and disseminate complete knowledge of the world. His current project asks how knowledge producers in the past conceived of the “ends” of learning and what their modern counterparts believe to be the ultimate goals of their own fields of study. The book seeks to reveal or generate language, ideals, and methods that may facilitate mutual understanding and collaboration across the arts and sciences as the institutions and organization of knowledge production continue to change. Literature and Encyclopedism in Enlightenment Britain. Palgrave Macmillan, 2014. Print. “Gaming the Golden Age of Piracy.” Digital Defoe: Studies in Defoe & His Contemporaries 7.1 (Fall 2015): 34-65. “Stories of Everything: Epics, Encyclopedias, and Concepts of ‘Complete’ Knowledge 1667 – 1729.” The Eighteenth Century 55.4 (Winter 2014): 411-30. "Knowledge and the Systematic Reader: the Past and Present of Encyclopedic Reading." Culture Unbound: Journal of Current Cultural Research 6.26 (2014): 505-26. "Pope, Swift, and the Poetics of Posterity." Eighteenth-Century Life 35.3 (Fall 2011): 1-28. "Stage Presence: Performance and Theatricality in Dickens′s Our Mutual Friend." Dickens Studies Annual 37 (2006): 65-80.